Our excellent run in the league was carried on by 2 magnificent wins over Manchester City and Tottenham Hotspurs. Both teams were sent packing after identical 4-1 wins. 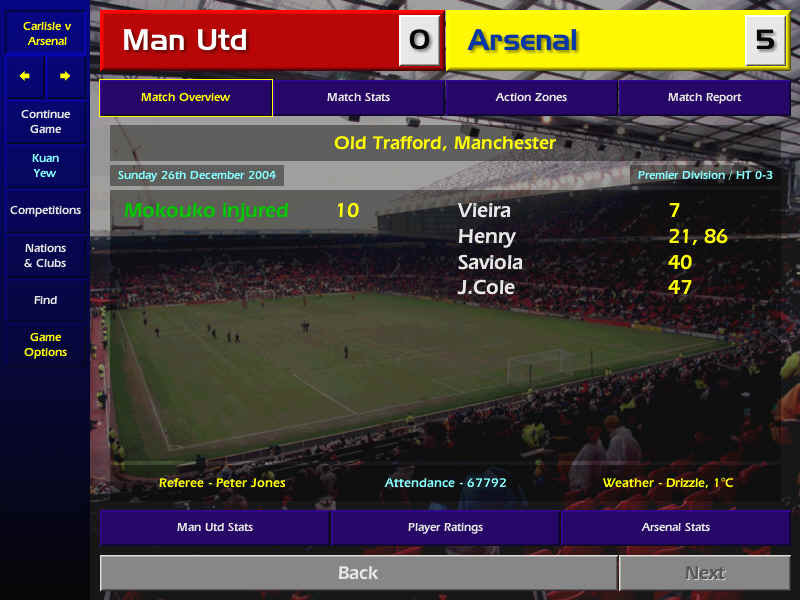 With Saviola scoring a brace in the former match and Henry hitting a hat-trick in the latter. This saw Henry picking up the Player of the Month award for November. I was voted Manager of the Month for October. 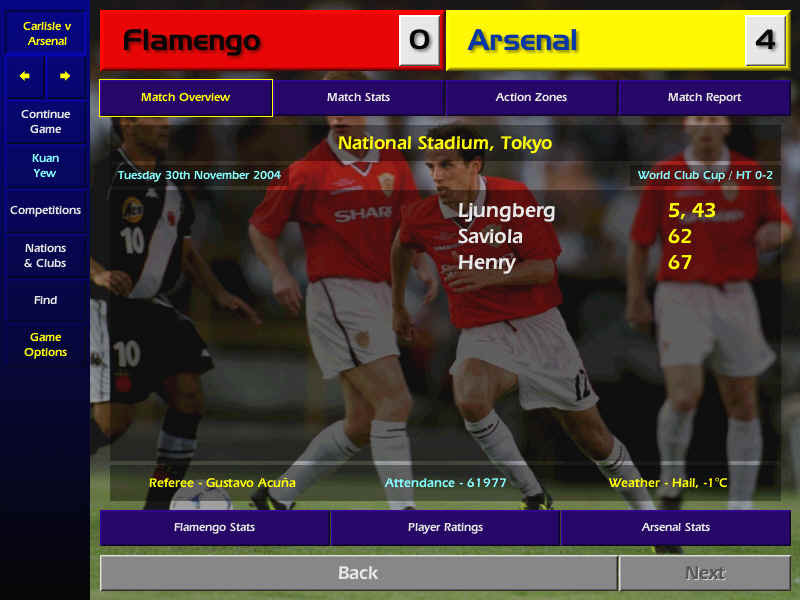 In the Champions League, we finished as group leaders after wins over Servette FC (2-0), Feyenoord (2-0) with Ljungberg scoring his 50th Arsenal goal and a 3-0 win over Monaco. The shock of the Champions League came when Real Madrid were dumped out of the Cup and also a place in the UEFA Cup by Panathinaikos, who thrashed them 7-0, Nikos Liberopoulos scored 6 of them. The Phase 2 groupings saw us being drawn with AC Milan, Celtic and Premiership rivals Huddersfield. The first match saw us visiting San Siro. 67,000 fans were at the historical stadium watching the match. No one would have guessed the score line after the match. Both teams started strongly and were held to a 1-1 draw in the first half. Arsenal came out of the second half a changed side. On the hour, Saviola scored his 100th goal for Arsenal and his second of the match. Calaio added another in the 71st minute before Greening scored in the 86th minute to condemn Milan to their heaviest defeat. 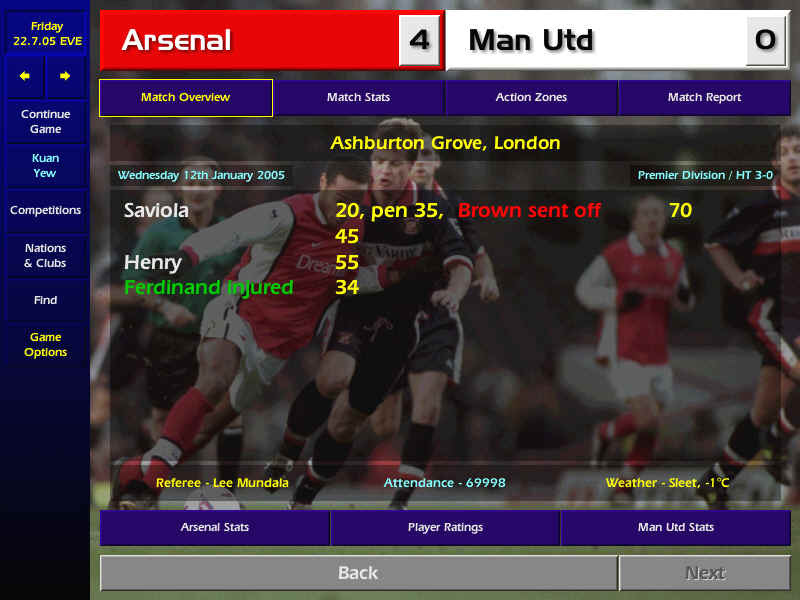 Saviola wrapped up his hat-trick and Arsenal's fifth in the 87th minute. Milan fans were gutted and started to vent their anger by throwing firecrackers into the pitch. They were later fined 500,000 Lira for the havoc. We went home with 3 points and a 5-1 victory. [ScreenShot] The match against Celtic was tougher but we managed to hold on to a slim 2-1 win. We suffered our first defeat of the season at the hands of Leeds United. We failed to overcome an early 2-goal deficit resulting in a 2-1 loss. Bristol City rubbed salt into our wounds when they beat us fair and square by 2 goals to none. Both goals coming in the last 10 minutes of the match. The newly assembled Arsenal Youth team was having an enjoyable time in the domestic cup runs. The League Cup 3rd Round tie was at home against Everton, they won the match 2-0, with new boy Craig Flynn scoring the opening goal. The 4th Round match was against First Division Reading. Former Gunner Mendez was in the team but he got himself injured in the 24th minute. Still, Reading took the lead and we had to wait until the 74th minute before Junior Elliott equalised. The match was heading towards extra time before 2 quick goals by Pennant and Benson gave the score line a much respectable look. Tranmere Rovers came to Ashburton Grove for the Quarterfinal match. Arsenal took the lead but was soon down to 10 men after David Hunt was sent off. John Spicer increased the lead but Tranmere caught up and equalised in the 85th minute. Super sub Cassano applied the winning goal in the 99th minute and we had booked ourselves for the Semi Finals against Derby County.